Green Valley's many low-maintenance, age-restricted communities bring snowbirds every winter. Green Valley is an unincorporated town in Southern Arizona that is very popular with snowbirds. 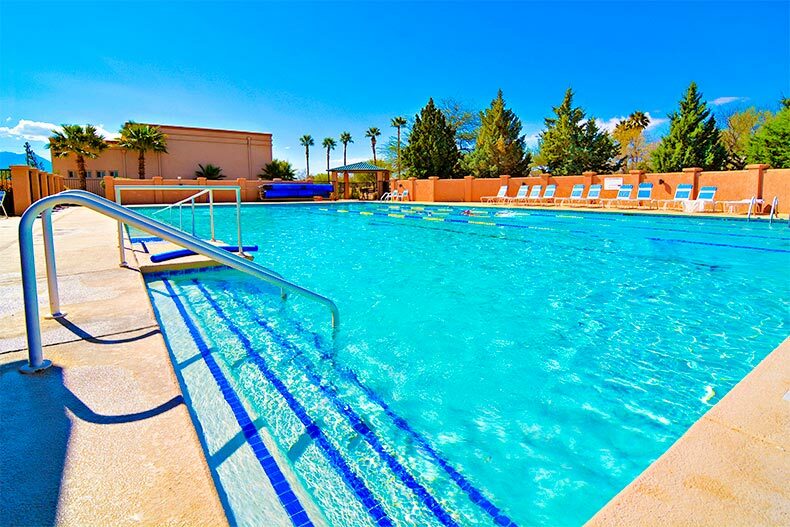 About 80 percent of the homes in Green Valley are age-restricted, making it attractive for the 55+ active adult, with numerous golf courses, pickleball courts, tennis courts, swimming pools, and other amenities. Green Valley is very much a snowbirds community, which means that when people go away for the summers there are services such as house-sitting available. Neighbors who live in Green Valley year-round are also used to keeping an eye on the homes of snowbirds. Green Valley draws in snowbird because of its climate and nearby outdoor recreation. Green Valley is 25 miles south of Downtown Tucson and 135 miles from Phoenix Sky Harbor International Airport, a two-hour drive. Tucson International Airport is 23 miles away, and the border town of Nogales, divided between Arizona and Sonora in Mexico, is 42 miles to the south. Being unincorporated means there are less public facilities to support, which in turn means lower taxes. Green Valley does have a volunteer fire department, a sheriff's office, a hospital, a library, a post office, and other amenities, but property taxes are lower and there is no city sales tax added to bills. The cost of living in Green Valley is 2.9 percent lower than the US national average. Property prices are lower too. One disadvantage is that gas prices are considerably higher than they are in Tucson, and many residents fill up when in Tucson, or drive to the cheaper gas stations in South Tucson, which is about a 30-minute drive. The other side of this is that Green Valley is a very golf cart-friendly destination. Lots of the roads have designated golf cart lanes, and many residents make a considerable saving on gas costs by using golf carts for all their local trips. Some residents use golf carts and never set foot on a golf course. Tucson International Airport is also on the south side of Tucson, and a 30-minute drive from Green Valley. For snowbirds who fly to Green Valley, this is close enough for friends or neighbors to come and pick you up, or to get a cheap taxi or Uber. 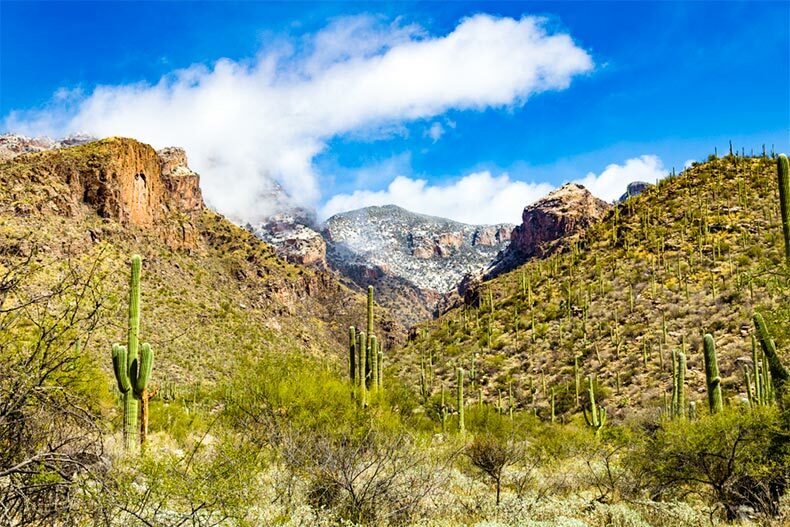 Being a snowbird in Green Valley means getting the best of the Southern Arizona climate. Spring and fall are the most pleasant seasons, with almost perfect weather. May usually brings the start of the hot summer season, when temperatures begin to rise above the 100 degree mark, followed by the heavy rains and storms of the monsoon season. Snowbirds miss the worst of the weather, while escaping winters back home. Winters in Green Valley do usually see several nights when the temperatures will drop below freezing, requiring the covering of water pipes and some of the more delicate plants. Some winters will see a light dusting of snow on one or two days, which never lasts for long, and some winters see no snowfall at all. Green Valley has its own hospital, which opened in 2015, and is also only a 30-minute drive from St Mary's Hospital in Tucson. Green Valley has numerous medical services including doctors, dentists, opticians, and podiatrists. This is in addition to the health benefits of being in the warm and non-humid climate of Southern Arizona generally, which is beneficial to people with conditions including asthma and arthritis. When it comes to dental work, many residents take advantage of the proximity to Nogales, Mexico, which is a 45-minute drive to the south, and see one of the numerous dentists practicing there. Most dentists have trained in the U.S., and some have more advanced equipment than dentists in Green Valley, with prices typically being about one-third to one-half what they are in Green Valley or Tucson. Just one of several pools throughout Green Valley Recreation. 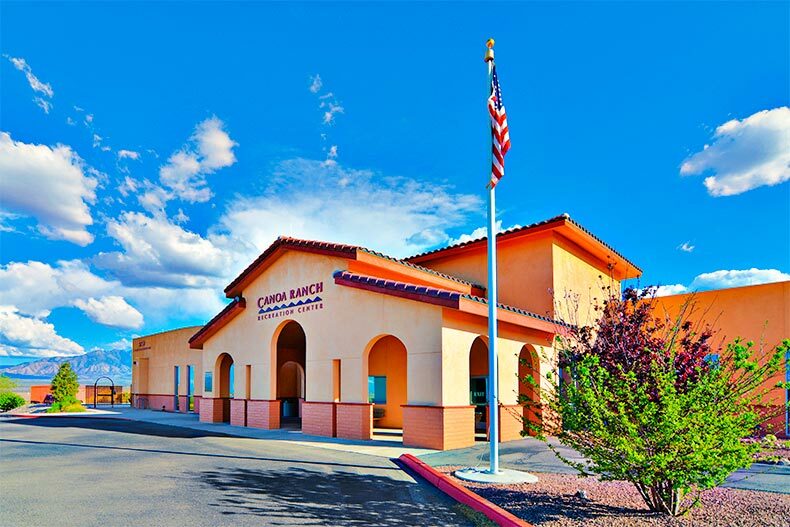 Green Valley Recreation (GVR) is a non-profit organization which operates 13 recreation centers and many other amenities, with all members having access to all of the facilities and the more than 60 clubs which GVR operates. A majority of homes in Green Valley belong to GVR, with membership belonging to the home and not to individuals. Membership is deed-restricted and cannot be resigned. Members who take full advantage of GVR's facilities regard the annual membership fee of a few hundred dollars as a bargain, even if they are snowbirds and only in Green Valley for part of the year. If you don't intend to take advantage of the facilities, you can save money by choosing a home which does not come with GVR membership. If you change your mind you can always buy-in later. For the snowbird golfer, Green Valley offers a year-round playing season and six golf courses within Green Valley itself. Four of these are public courses and two of them private clubs, with costs being about the same as elsewhere in Arizona. In addition, there are another 40 or so courses within easy reach of Green Valley, including many in Tucson. GVR currently has 12 pickleball courts for use by its members and their guests, and the Pickleball Club at GVR has 700 members. However, the number of courts is set to increase dramatically with plans in hand to build a 24-court dedicated pickleball complex on a former golf course just off Interstate 19 and close to Canoa Ranch. The center will also have an instructional court with tiered seating, though no date has yet been set for the completion of the project. So, Green Valley is certainly good for snowbirds when it comes to golf, pickleball, medical services, health, and money savings. In fact, snowbirds are very much a part of its way of life.